It was following a game against Utah in 2009 that the Ducks last found themselves voted off the AP Top 25 island, so it is only fitting that a game against Utah, mark their first return outside of it in six years. The 98 weeks in-between provided a glorious run of historical proportions for the Ducks: Their first Rose Bowl appearance in 15 years, two Rose Bowl wins, the first of which ending a 95-year drought, which is to say nothing of the two National Championship appearances, four PAC-10/12 titles, four Top-4 finishes, and the first No. 1 ranking in school history that were all celebrated during that time. It was an unprecedented time for a program long bereft of success. That magical run came to a screeching halt with the 62 points scored by Utah, the most allowed by Oregon at home in school history. In fact, it was their worst home loss in nearly 40 years, and their worst overall loss in the past 12. When the end happened, it happened fast, it happened hard, and the era was finished. Optimism is not dead for the Ducks. The other shoe on a great run has finally fallen, but that doesn’t mean the sky has. There is no reason to assume the Ducks are destined for mediocrity. The team is too talented, too well supported, and too well-positioned for this to be permanent. Rather, this slide is simply a circumstance that happens to all great programs: There are seasons of regression, especially with young teams, and especially after trying to replace a Heisman Trophy winner, which is exactly what the Ducks are currently experiencing. It had previously been assumed that Oregon’s 2013 season was the rock-bottom of their status as an elite program in college football, a regression the Ducks rescued themselves from by returning to their “rightful” place last season. 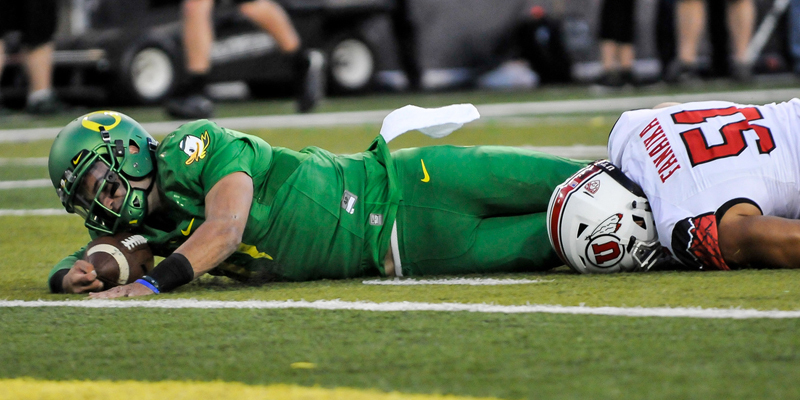 The assumption was that Oregon is plug-and-play, reload not rebuild, next man up and so on. But in reality, teams have good seasons, bad seasons and various in-between seasons. What makes a program “good,” is its consistent ability to have a high frequency of winning seasons, but no program is immune to years of regression, even if only temporary. Ten-win seasons in perpetuity are not sustainable for any program. Many national champions have had drop-offs in the years after their titles: LSU went 8-5 in 2008, Florida went 9-4 the year between its two most recent titles, and that’s to say nothing of title runners-up that finished with eight wins or fewer, such as Nebraska, Oklahoma and of course Texas, which failed to make a bowl game in 2010 after its title game run the year before. The sun sets in Saturday’s game. We tend to think of national champions in terms of their dynastic runs and year-after-year success, but even those dynasties can end in coaching changes. Pete Carroll and Nick Saban left the programs they coached to titles, for opportunities in the NFL. Urban Meyer left Florida when he “retired,” just two years after their last championship, and the on-field product dwindled so quickly at Auburn after its championship in 2010 — with seasons of 8-5 and 3-9 the next two years — that it promptly fired head coach Gene Chizik faster than any championship-winning coach in modern history. Of course, the very next year they returned to the title game with a new coach. That is the lesson for college football teams; all programs that experience success, will also experience transition and regression. 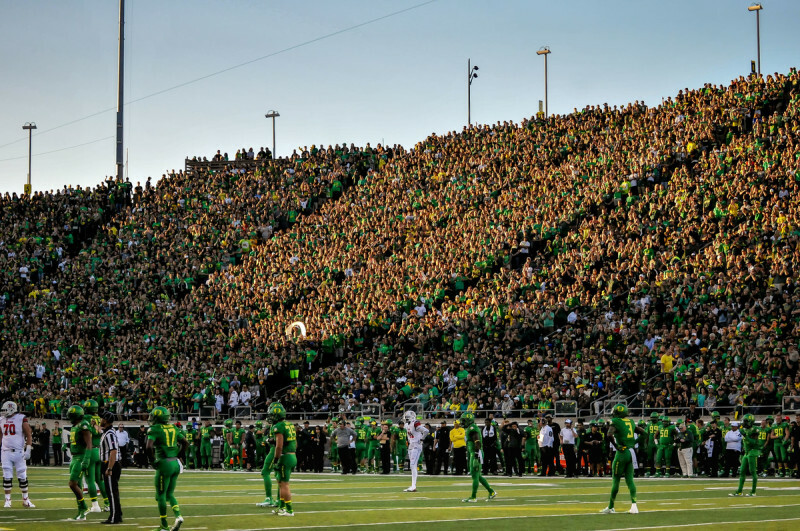 Oregon is not alone in regressing from the elite, and its track record of success is more recent than other programs’, which provides us with little long-term historical evidence to assure fans that they will rebound. But during the past two decades, the Ducks have gone through multiple transitional periods — and they came out stronger each time. Just like the not-quite ghosts of Oregon’s past, this team will find its way out. So this should be seen as a milestone; an opportunity for the coaching staff to define itself under its own terms. Improved fundamentals will be essential for the Ducks to succeed, and if they do succeed, it won’t be because of Marcus Mariota’s arm or Chip Kelly’s system. It will be because of the work that this staff, alone, puts in. Things looked very different for Oregon in 2003. Don’t forget what happened 12 years ago — 2003 was a rough year for Oregon football. The Ducks had lost nine of the last 14 games, their pro-style offense just was not cutting it. But between a 55-16 loss to Washington State, and a particularly nasty 59-14 Arizona State loss, sat a loss to Utah that changed the face of Oregon football forever. Head coach Mike Bellotti saw the utility of the Utes’ spread offense, but was unable to persuade his offensive coaching staff to implement it. 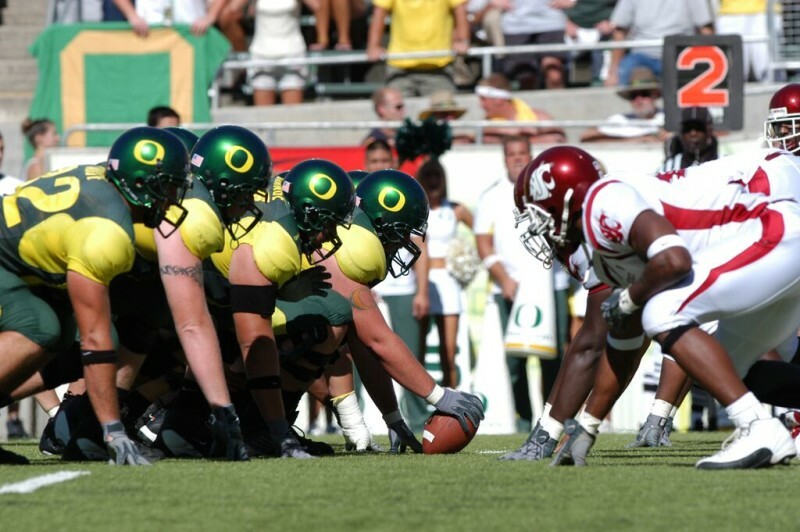 It took the 2004 season — Oregon’s only losing campaign since 1993 — for Bellotti to pull the plug on that old-fashioned, pro-style relic, and switch to a system which paved the way for Oregon’s success over the past decade. The Ducks are at the end of an era, but that does not mean they are at the end of their success. Just like 10 years ago, their rivals have caught up, and now the Ducks have to fall back on their trademark tradition: Innovation. How they choose to respond and how they evolve will determine the future of the Quack Attack for generations. We fans are lucky enough to witness this changing of the guard, as the true beginning of the Mark Helfrich era. Whether or not our Ducks will rise to heights never before risen, or soar in skies touched only by outstretched fingers of imagination, can only be answered in time. But until then – GO DUCKS! Top photo by Craig Strobeck.